To review, FRE 902(14) provides that electronic data recovered “by a process of digital identification” is to be self-authenticating, thereby not routinely necessitating the trial testimony of a forensic or technical expert where best practices are employed. Instead, such properly collected electronic evidence can be certified through a written declaration by a “qualified person,” attesting that they verified the hash value of an offered item of electronic evidence and that it was identical to the original. To enable compliance with Rule 902(14) for social media evidence, we have developed and are now releasing a freely available, patented electronic evidence verification tool for use in conjunction with evidence collected with X1 Social Discovery. The tool is used to verify the hash values of evidence collected by X1 Social Discovery, including social media evidence, webmail, and website collections. When collecting social media evidence, X1 Social Discovery generates an MD5 hash value for each item preserved, on an automated basis at the time of collection. The validation tool allows the examiner to generate a “verification” hash calculation against the original, and thereby be able to certify the authenticity of the evidence under Rule 902(14). However, the ephemeral nature of social media evidence presents unique, but not insurmountable challenges. The available fields that make up an item of social media evidence such as a Facebook post are dynamic and complex. Metadata fields are constantly added and removed by the social media platforms to provide new features or remove old ones. Recurring changes to metadata fields necessitates the dynamic addition and/or removal of critical fields for hash calculations, causing the need for a new methodology that allows for the algorithms which calculate the hash value to be updated on a version by version basis. For this reason, we have released a special point upgrade of X1 Social Discovery, version 5.3.1, which works in conjunction with the X1 Social verification tool. Here’s how it works: During the ingestion process of evidence into X1 Social Discovery, an MD5 hash value (digital fingerprint) is calculated by using key metadata fields and/or content (depending on the source type) of the item to ensure the evidence is not altered post collection. The hashing process is done in a similar fashion to hashing email items for deduplication in the eDiscovery industry. The result, as seen in the below screenshot, is that the original collection hash of an item collected by X1 Social is verified by the re-calculated or verification of the item by the X1 Social verification tool. This report is designed to map to the 902(14) procedure outlined in the Rule and its accompanying Committee Notes. The examiner can take the results of this report and attest to them in their written 902(14) certification. The tool itself is automated and easy to use with a single interface. On April 5, we will be hosting a live webinar to provide an update on Rule 902(14) and to demonstrate in detail the X1 Social verification tool and how X1 Social Discovery effectively maps to the requirements of 902(14). We look forward to seeing you at the webinar. Please register here. In a terrorism case before the Supreme Court of British Columbia, a defendant currently faces charges for allegedly supporting and conspiring with the Islamic State of Iraq and Syria (“ISIS”). R v. Hamdan 2017 BCSC 626 (April 24, 2017). The charges are solely based on 85 Facebook posts made by the Accused, Othman Ayed Hamdan (“The Key Posts”). The RCMP investigators took screenshots of those posts, using “Snagit” and “Awesome Screenshot” tools, and the Crown Prosecutors sought to admit into evidence the 85 Key Posts as well as the captured Timelines from the Facebook pages and profiles that contain the Key Posts. The defense, in a pre-trial hearing, sought to have the evidence barred in advance of trial, asserting that “the RCMP should have used forensic software that is readily available at a modest cost to capture, preserve and authenticate the Facebook profiles and pages. By failing to use that software, the RCMP was negligent and Mr. Hamdan’s ability to make full answer and defense has been seriously impaired…” The defense expert specifically mentioned X1 Social Discovery as an acceptable tool that could have been used by the RCMP. R.v Hamdan, 2017 BCSC 676, at note 31. However, the Court, in making clear its decision was a one-time exception based upon the circumstances of the case, did not ultimately exclude the evidence. Instead, the court required the prosecution to submit to several additional steps and showings of authenticity, without being able to take advantage of any presumptions in its favor. These steps included direct subpoenas of Facebook to match up IP addresses, live testimony from several witnesses, and extensive litigation of the issue through motions and a long Court hearing. This case is binding on trial courts in British Columbia and strongly applicable to all other Canadian trial courts. The decision provides persuasive authority to other Commonwealth nations such as England, Australia and New Zealand. R v. Hamdan may also serve as persuasive authority in the United States for courts considering the reliability of screen shots to collect web-based evidence. The prosecution was not able to invoke the presumption of integrity under the Canada Evidence Act to admit the social media evidence, the court determined that the collection process used was not reliable. The application of the Canada Evidence Act in this case is analogous in many ways to the application of Federal Rule of Evidence 902(14), which will become effective on December 2017. I have covered FRE 902(14) extensively on this blog. See here and here. X1 Social Discovery was favorably cited – by the defense! The assertion was that the RCMP should have used forensic grade software like X1 Social Discovery but did not. The court agreed, for cases going forward. This is a unique but very important development. Also very notable was the Court’s excoriation of Snagit and other screen shot tools as an unreliable evidence collection method. And of course, this case underscores the importance and benefits of X1 Social Discovery. In addition to being fast and highly scalable, X1 Social provides enables the examiner to present the best case possible for authenticating social media evidence collected with the software. 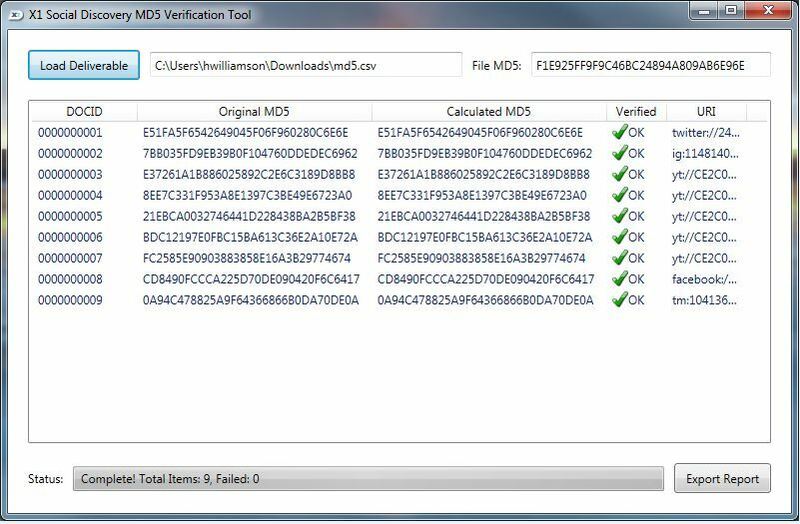 This includes collecting all available metadata, preserving links and other context, and generating a MD5 checksum or “hash value” of the preserved data for verification of evidence integrity. A full copy of the court’s opinion in R vs Hamdan can be found here.